The Most Reverend William Donald Borders, D.D. Impaled arms. Dexter: Quarterly azure and argent, a cross botonny thoughout of the second and gules, in dexter chief a star of the second (Archdiocese of Baltimore). Sinister: Argent, within a double tressure flory counterflory of seven gules, an eagle rising, wings elevated and addorsed sable, holding in the beak an olive branch vert. Archbishop of Baltimore. Motto: Auscultabo ut Serviam. The entire “achievement,” or coat of arms as it is generally called, is composed of the shield with its charges, the motto and the external ornaments. As one looks at the shield, the terms dexter and sinister must be understood contrariwise, as the shield was worn on the arm in medieval days and these terms were used in the relationship of one behind the armor. The dexter impalement bears, according to custom in ecclesiastical heraldry, the jurisdictional arms of the Archdiocese of Baltimore. On this field a quartered red and silver cross from the second and third (Crossland) quarters of Lord Baltimore’s coat of arms is emblazoned. This cross is a reminder that Maryland was the first colony in the New World where religious toleration was established. Planned by George Calvert, the first Lord Baltimore, a Catholic convert, it was founded by his son, Cecil Calvert, the second Lord Baltimore, and named for a Catholic queen, Henrietta Maria, wife of Charles I of England. The sinister impalement, on the right of the viewer, displays the personal coat of arms of Archbishop Borders. By uniting the personal coat on the same shield with the arms of the diocese, the spiritual unity of an Archbishop with his See is signified, a thought also expressed by the ring which he wears on his right hand. The double red border is a canting reference to the surname Borders. Canting arms, which “sing out” and allude to the name of the bearer of the shield were popular with medieval heralds. The double border with eight fleurs-de-lis is known as a double tressure flory counterflory, and as such it is one of the two charges on the coat of arms of Scotland, the land of the Archbishop’s ancestors. However, one fleur-de-lis has been omitted that the number of fleurs-de-lis might symbolize the Seven Sacraments which the Archbishop dispenses with the fullness of the Priesthood. Within the tressure an American eagle refers to the presence of the forebears of Archbishop Borders in the United States since colonial times. The eagle bears an olive branch for peace which the Archbishops, as successors to the Apostles, are commissioned by Christ to bring to the world. In this sense, the olive branch reflects, “That I May Serve,” in his motto. The motto is translated, “I will listen that I may serve.” A motto briefly expresses an ideal, a program of life and the spirit of the one who bears it beneath the shield. The external ornaments of the shield are composed of the pontifical hat with its ten tassels on each side, disposed in four rows, all in green, and archiepis-copal cross with double traverse tinctured in gold. 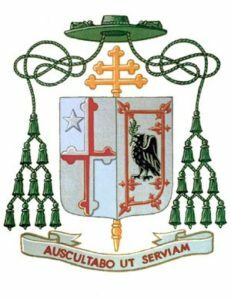 These are the heraldic insignia of a prelate of the rank of Archbishop in accordance with the Instruction of the Holy See of March 31, 1969. Before 1870, the pontifical hat was worn at solemn cavalcades held in conjunction with papal functions. The color of the pontifical hat and the number and color of the tassels were signs of the rank of the prelate, a custom which is still preserved in ecclesiastical heraldry. Description courtesy of William F.J. Ryan, Heraldry, Ecclesiastical and Secular.